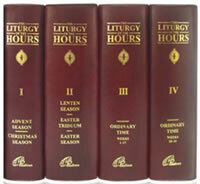 The four-volume set contains the whole text of The Liturgy of the Hours, namely, the Office of Readings, Morning, Daytime, Evening and Night Prayer, as well as all the texts for the liturgical seasons and the saints including the African saints. Psalms, Benedictus, Magnificat, and Nunc Dimittis are from the Revised Grail Psalms (GRAIL) 2008. The one-volume Prayer of the Church contains all the texts found in the four-volume set except the Office of Readings. This volume also includes the commemorations of the African Saints. Psalms, Benedictus, Magnificat, and Nunc Dimittis are from the Revised Grail Psalms (GRAIL) 2008. This small one-volume Christian Prayers contains the four-week Psalter and some other texts to enable the faithful to pray Morning and Evening Prayer in communion with the whole Church.